If in the past wedding ribbons were used only for wrapping, nowadays, each and every decor element or accessory of your wedding can be accentuated by simply adding personalized wedding ribbons. Personalized wedding ribbon can be used for most of your wedding details, starting with wedding favors, wedding flowers, wedding gifts, and ending with wedding tags, giving them an elegant and fancy look. 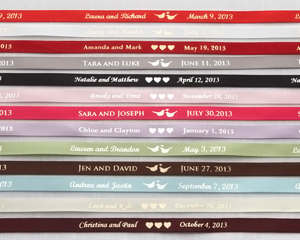 Choosing the color for your personalized wedding ribbons is an easy task. All you have to think about is the colors you chose for your wedding. For example, for a red and white wedding, you can choose either red or white wedding ribbons. But if you want to add something spicy to your wedding you could choose a black ribbon for your personalized wedding. When talking about personalized fabric for your wedding ribbons there are some things to consider. You may want the ribbons to match the fabric of your wedding dress or you may want them to be different but elegant. 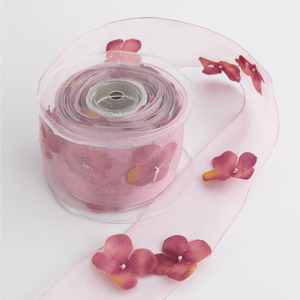 The most common ribbon fabrics are: satin, organza, mesh, grosgrain, wired sheer and polyester. 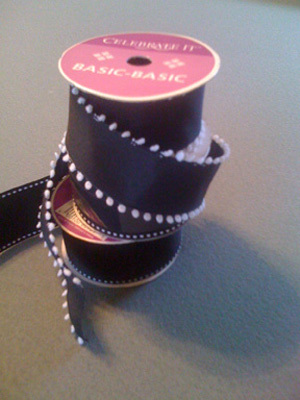 For a wedding dress that has satin in it, I would go with satin wedding ribbon. 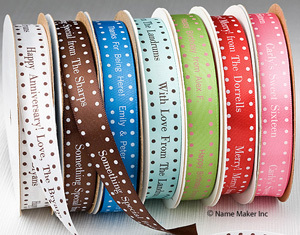 Except the mesh wedding ribbon all of the other fabric can be personalized by printing your names and your wedding day. Printing the wedding ribbons with your names or with a monogram of your names, or with any other symbol or image you prefer is the easiest and most elegant way to personalize your wedding ribbons. You can choose a personalized color and font for the printing and ensure an accentuated decor at your wedding. Depending on your wedding theme you may want to personalize the font and the color of the writing on your wedding ribbon. 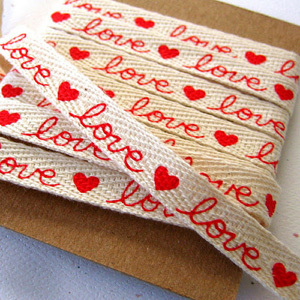 For example, for a vampire themed wedding, I would have the ribbons written in red and italic style. It makes it more mysterious and charming. When I think about wedding ribbons design I have in mind some color mixes that you can choose to make sure your wedding ribbons are uniquely personalized. My favorite ones are the ribbons that have small dots on them, but there are also ribbons with geometrical shapes, or with animal themes on them. If you want to add the out of ordinary touch to your personalized wedding ribbons, choose a design that would catch your guest eyes.